Writing Is Bad for You. Stop! We don’t have ordinary cars in the Caves so we don’t need Car Insurance. Do we? Zawmb’yee Nuje has finished writing the blog for now. Before she became fully possessed and evil she turned over the codes to Doug who will now write the Blog. I hope he doesn’t write anything that will destroy the world anytime soon. Well, actually I know that he will because I’m from the future, but I’m going to try to change this timeline. We’ll see what happens. Traveling to this time period before we emerged from the caves is a bit disconcerting. I can’t seem to remember where the secret entrances to the caves are. So in this place in time I have no authority. If I could get back to The Cave of the Third Sun, I would preside over the Forbidden Zone, and would be well respected… um, well, until the rebellion, and the war of course. Time travel, as they say, is not what it’s cracked up to be. Difficult and confusing. I’m not sure if this present chaos is better than one of the future chaoses. 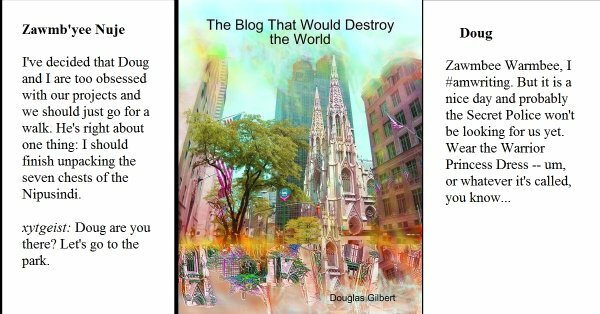 I hope I don’t make the same mistake that Doug and Zawmb’yee made: come up-top, assimilate incompletely and haphazardly, and write a blog which ends the world. Well, yes, I know, I travelled back in time specifically to prevent that, but now that I’m here, now, I can’t remember what my plan will have been. I mean, then in the future coming to now. Of course. Huh what?